PKK FIGHTER. Women as well as men have will to fight, but not always the weapons. And as they face ISIS, Turkish NATO forces attack their back. The militant Popular Front for the Liberation of Palestine (PFLP) has expressed its solidarity with the Kurdish resistance in Kobani struggling to defend themselves and their community from the reactionary Islamicist armed group, ISIS, which it says was ennabled to enter the Middle East region by the support it received from imperialist powers and their lackeys. "People in Syria, Iraq and everywhere in the region have been under attack by imperialism – an attack that comes not only through air strikes and occupation, but through the support of reactionary regional powers, through the promotion of sectarianism, and through reactionary armed groups carrying out a program of sectarian chaos. They have sought to replace the central conflict in the region: that of the people with Zionism and imperialism, with sectarianism and the imposition of massive, reactionary violence against minority groups who are an integral part of the region, while these same reactionary armed groups leave the Zionist state and imperialist forces untouched." For once I agree with the PFLP, and I'm inclined to accept their support for the Kurds as genuine. Some years ago at a conference in Vienna, attended by many high-powered Arab and pro-Palestinian delegations, I arose somewhat nervously during a session on nuclear and chemical weapons, to point out that the latter had already been used in the Middle East. "Yes, against the Kurds!" exclaimed someone from the large PFLP delegation (which included famous 'plane hijacker Leila Khaled), to murmurs of assent. So I knew I was not alone, and need not feel hesitant about the point I was making. Having armed Saddam Hussein's Iraqi regime with all they could, Western powers were reluctant to admit that he had gassed Kurds at Halabja, until years later when they wanted excuses to invade Iraq and it suited them to remember. Then one of the places the US managed to bomb too was Halabja. The situation in Syria and northern Iraq now is complex, but it's good to see the PFLP for one not turning away, nor letting their justified suspicion of imperialist aims and motives serve as an excuse for not taking sides, and ignoring the basic right of the Kurdish people and others to fight to survive, and expect solidarity. I am a British Kurd living the UK. Kurds in West Kurdistan ‘Rojava’ are being attacked by the barbaric gang ISIS or ‘Islamic State’. Right now in Rojava town Kobani, ISIS has nearly entered the city. There have been heavy clashes and Kurds are not stepping down as they have no choice but to fight for their livelihood. It is a matter of hours that a mass murder by this gang is waiting to happen. It is very important that Kobani town is helped by the International military coalition. Dear Diane, as an elected member parliament in the United Kingdom of Great Britain and my elected representative, I ask you to act now on the name of humanity. Kurds are the only secular, society who respect international laws and uphold the universal human right values. Humanity is under attacks not just Kobani. I beg you as a fellow human being and I know that you can change this. Please ask our PM, Mr Cameron to instruct our military forces to assist Kobani. Please tell Turks not to help ISIS. Yours truly, etc. Many Kurds from Turkey live in Diane Abbott's Hackney North and Stoke Newington constituency, and many of them support the Kurdistan Workers Party, PKK, whose fighters have gone to the aid of Yezidi refugees and are supporting those fellow Kurds fighting in Rogava, and resisting ISIS siege of Kobani. 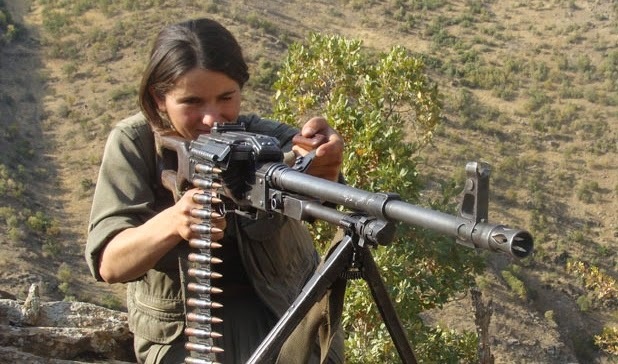 Yet the Turkish government, with which the PKK had been negotiating, after ceasing its armed struggle in Turkey, has launched its own raids against Kurds in Rogava, used its forces to prevent Kurdish fighters crossing into Syria, and bombed Kurdish targets in Turkey. Turkey is a NATO member. So is it not helping ISIS? The British and other NATO governments still list the PKK as a "terrorist" organisation, if only to please Turkey. Diane Abbott herself has in the past asked whether the then Labour government intended to arrest hundreds of her otherwise law-abiding constituents for their political sympathies. The Home Secretary said that was ridiculous. But now I have seen quote attributed to Diane Abbott to the effect that arming the PKK would be no different to arming and supporting ISIS. I have not been able to verify whether the MP said anything as foolish. But I can easily answer the assertion. One, if anyone wants to know the difference between ISIS and the PKK or any of the Kurdish parties, just check which direction the refugees have been moving. The second difference is that from what we have seen of the conflict so far, someone has already been arming and training ISIS - with mainly American equipment. Directing some weapons and aid to the poorly-equipped Kurdish fighters woul only be making up some of the difference. The “Iraqi solidarity” motion had been worked on with Roza Salih, a Strathclyde university student of Kurdish descent (she submitted an almost identical motion to the Scottish equivalent of the executive, the Scottish Executive Council, which I will post later, which, incidentally, did pass! One must ask Scottish executive members why vote for a motion in Scotland, but not in England?!). "The motion was opposed by Malia Bouattia, the NUS Black Students’ Officer, for astonishing and bewildering reasons. Bouattia argued that the motion was “Islamophobic” and “pro USA intervention” ...Apparently another NEC member, Aaron Kiely, tweeted during the debate to say how marvellous Bouattia's speech was. " The motion then fell as large numbers of NEC members either abstained or voted against (including the bulk of the political Left on NEC). I think this says a lot about the current state of the student movement." - which has resulted in thousands of Yazidi Kurds being massacred. against all the competing nationalist and religious-right forces. supplying them with goods, training, travel or soldiers. in the UK, in order to build solidarity and to support refugees. I can see nothing "Islamophobic" or "pro-imperialist" in this, nor does it owe anything to a "Western narrative", as the opponents claimed. If anyone felt it did not go far enough in denouncing US or British motives I am sure a simple amendment would have sufficed, rather than Britain's student union turning its back on the Kurds and effectively siding with ISIS. Perhaps some NUS NEC members fancy themselves more principled and doughty fighters against imperialism than the PFLP, but hopefully more students will have something to say about this. Although some more important left-wing movements in other countries are supporting the Kurdish struggle, it seems reluctance to do so is not confined to the British Left. Among the dishonourable episodes of the Stop the War Coalition here was when a group of Iranian comrades set out from Birmingham to march to London and take part in an anti-war rally, only to be told they could not have five minutes to speak from the platform because, being ...er, refugees, they did not support the Islamicist regime in Iran. So I was not entirely surprised to hear that in Australia, a group called Socialist Alternative, with roots not dissimilar to some of the Stop the War Coalition leadership, was opposed to opening anti-war platforms to speakers representing immigrants from Kurdistan. If we want to build principled working class internationalism we have a lot of wok to do. supplying them with goods, training, travel or soldiers." is a little strange - possibly designed to be defeated to kick up a media storm, the fallout of which has been considerable hate mail for some who opposed this motion.